nike – Countdown to the NYC Triathlon! 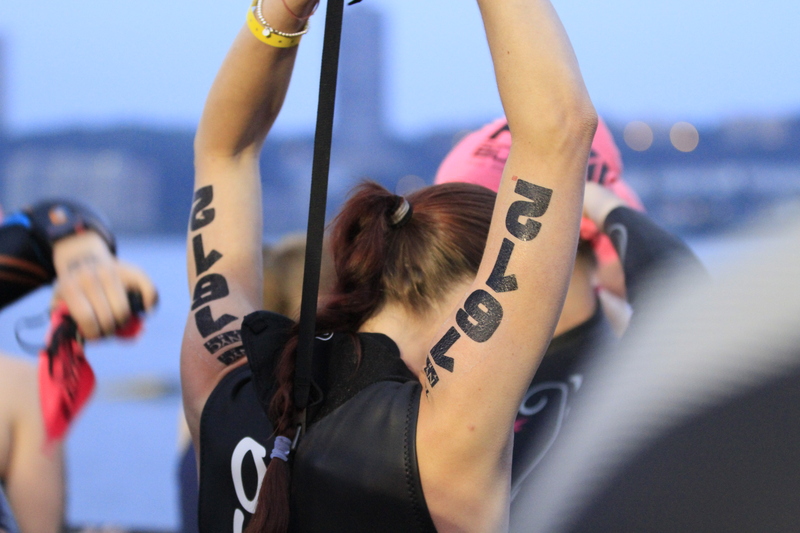 Countdown to the NYC Triathlon! swimming, biking and running (and on a plant-based diet). oh my! Oops, I did it again. I raced in sneakers that I had never run in before. 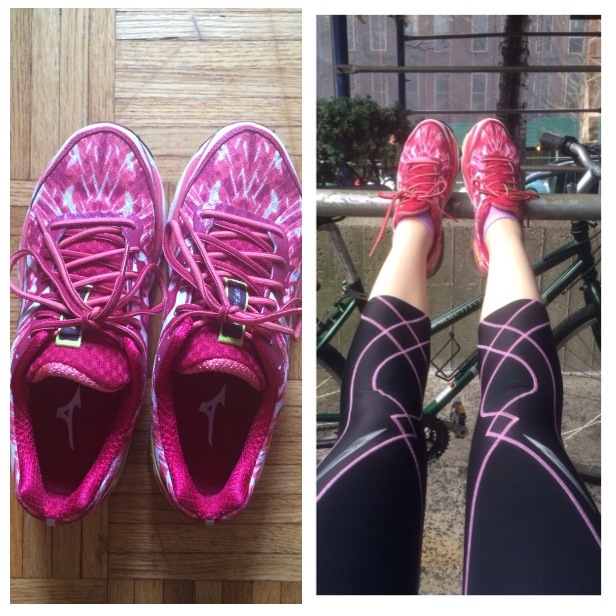 Last week I got some hand-me-down Mizuno sneakers from Carla because they aggravated her old Achilles tendon injury, and decided that they were the perfect shoes for the Run as One 4 mile race in Central Park, a race that supports lung cancer research. I’d heard amazing things about Mizunos and had been wanting a pair for a long time so of course I would run in them for this race, right? I mean, I wore them on that long bike ride yesterday and they felt great so I figured I was ready to run in them. Maybe not the best logic, but it worked out today! The temperature was predicted to be in the 60s today, but at 8am it was still pretty chilly so I wore shorts and a long-sleeve shirt with my Mizunos and got to the appropriate corral about 20 minutes before the start of the race, along with over 8,000 other runners. Katharine ran this one with me, so I guess she helped make sure I wasn’t late and rushing to the starting line like my last couple races. 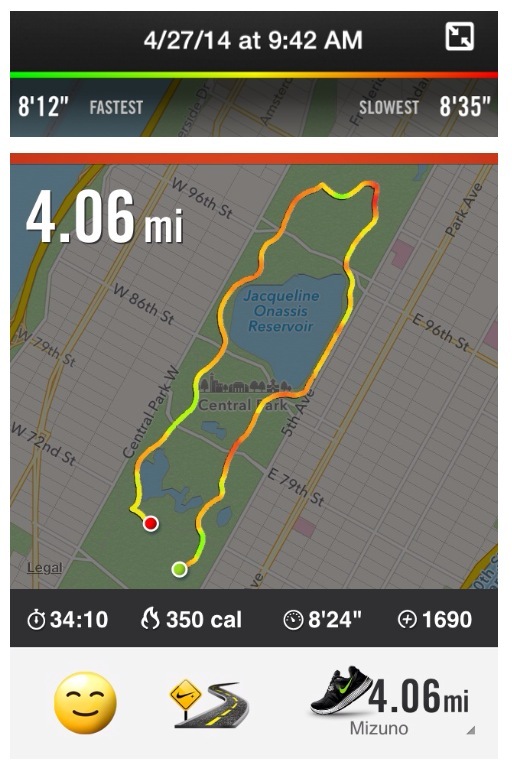 We started together, but I decided that since this was “only” 4 miles I would try to beat some kind of personal record. Fastest mile? Fastest 5k even? Something! Olympian Steve Prefontaine once said “The best pace is a suicide pace, and today looks like a good day to die.” (He also ran a mile in under 4 minutes. ) Whatever – I planned to run the hell out of this race. I started off pretty fast with 30 Seconds to Mars blaring in my ears. The race started near 68th Street and went counterclockwise around the inner loop of Central Park, which meant that the Cat Hill was right there. I sprinted up, glaring at the cat statue (as I usually do) and continued on my way. 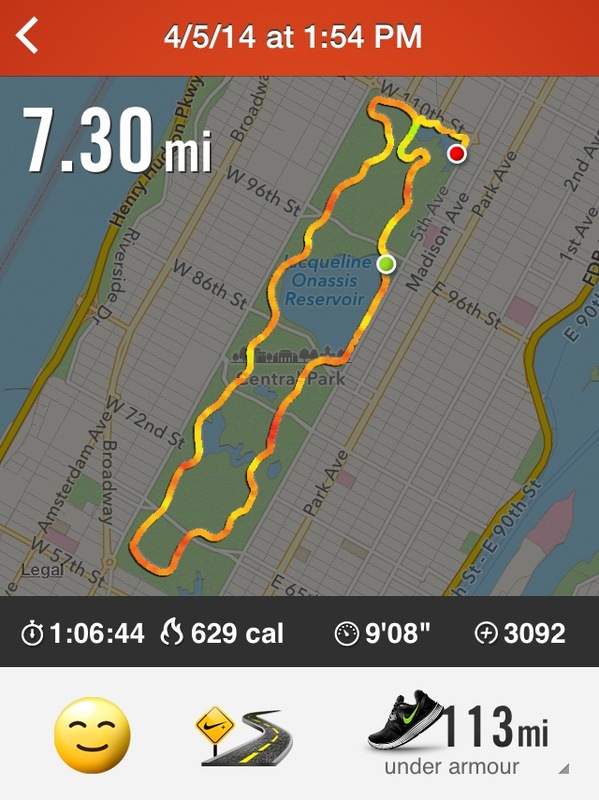 My Nike+ watch had me at an 8:35 pace on the hill, so I started going faster – to a 7:48 pace. It’s no Steve Prefontaine level, but it was all I had in me this morning (and I was digging it)! Before the first mile was over, I had to do something that I’ve never had to do in a race before – pull myself over to tie my shoe. In all my races, my shoelaces have never untied before but apparently my left Mizuno didn’t get the memo. I slowed down a little bit near mile 2 because we were turning onto the 102nd Street Traverse and there was kind of a bottleneck since the street got a bit more narrow and there was a water station there. I noticed that the Mizunos were heavier than what I was used to – most of my other sneakers are really lightweight and flexible, but these aren’t. But they were still comfortable, so that’s a plus. And they offered much more ankle support, which might actually be better for my foot. Before I knew it, mile 3 was behind me and I was wondering what kind of food they had at the finish line. Probably the usual bananas, but hopefully they had muffins. I was really in the mood for one a poppy seed one. Maybe a bagel, but those tend to be too heavy for after running. No, definitely a muffin. And then I realized the laces on my right Mizuno had come untied. Really, Righty? You didn’t learn your lesson when the left one untied? I had only about half a mile left and wondered if I could just run through it but, as I felt the sneaker get looser, I ran to the side of the road for a second time, tied it up, and finished the race. My fastest mile was 8:12 (not a PR, but I was happy with it) and my overall pace was 8:24. No records were shattered, but there’s always next time! Tomorrow officially starts week 6 of triathlon training, which means one thing: our first of many BRICK sessions (which is running right after biking) begins this week. I guess now is as good of a time as any, so bring it on! Never fear – I have the More Fitness Women’s Half Marathon next Sunday so there is yet another chance for the elusive amazing in-race photo! Since the half marathon is in Central Park, I headed over there yesterday for a quick run to remind myself where all the hills are (like I could ever forget!!). It was a beautiful day, the sun was shining and my sunglasses were on, and I was doing the usual linking satellites dance with my watch. I was relieved when everything was linked and ready to go because I was getting a bit chilly waiting around. But to be fair, if it is less than about 85 degrees outside, I feel like I live in a perpetual state of cold. Ok, satellites were linked and I had my Jekyll and Hyde Pandora station on. Seriously. Broadway tunes will get you through any workout, I promise. For example, during one of the tougher hills This is the Moment (from Jekyll and Hyde) came on. If that doesn’t motivate you, I don’t know what will. So I ran to some J&H, Beauty and the Beast, Les Miserables, Rent, and Wicked, (lip-syncing my way through, of course) and was just about to stop at 6.2 miles when Phantom of the Opera came on – my grandma’s favorite! I took it as a sign to keep running, and ended up doing 7.3 miles before calling it day. Today was a quick ballet class earlier and then a 16 mile bike ride on the little pink stationary bike while watching In Time with Justin Timberlake and Amanda Seyfried. (Totally loved it – watch it if you haven’t.) In the next couple weeks I should have a real bike of my very own. I’m fairly certain that I’ll get run over by several cabs before the triathlon, but I guess we’ll have to wait and see! Monday, Monday – here we go! My day started with an email from one of the TNT coaches that pretty much laid out the entire training schedule. It started out with “1-19” – 1 meaning the first full week of training and 19 being, as he put it, “the number of weeks to go until your date with the Hudson.” Yikes. I’ve been on some pretty crazy dates in my life, but I think my date with the Hudson will be one for the books! As I read the training schedule on the subway on my way to work, I realized that I would not have much of a life until this triathlon was over. Luckily I am a summer girl and thrive on sunshine. I am outside every possible moment of summertime soaking in Vitamin D and recharging my batteries after a long and cold winter, so running and biking all summer long doesn’t sound like the worst thing in the world at all. PLUS that just means more time at the beach to practice swimming in open water!! On second thought, this triathlon might actually be one of my best ideas yet..! Today on the schedule was either a rest day or a swim day, depending on your location/swim ability. The Manhattan swim was for advanced swimmers, and I am not there yet. Actually, the swim part is the most nerve-wracking part for me. I can doggy paddle, swim under water like a frog, and tread water, but the crawl is not something I was ever able to do well. Also, when I think of the swim part of a triathlon, my mind immediately pictures the scene in Titanic right after the ship sinks and everyone is in the water frantically splashing around and grabbing onto each other for survival. I’m told that the tri will be nothing like that. Maybe it will just be me – Half drowning. Trying to catch a ride on the back of the nearest swimmer. Maybe they’ll let me wear floaties. Or bring an inner tube. Maybe a raft and a margarita? By the time 5pm rolled around, Tony the Trainer texted me to let me know that he had to cancel so I considered taking a rest day, but decided to go for a run at Central Park. I got home and put on my fleece-lined running pants, threw on some layers, and looked frantically for one of those headband things that go over your ears. All I could find were hats. I couldn’t wear one though – my hair was in a curly ponytail and I liked the way it looked. I didn’t want to hide that lion mane under a hat. Don’t judge me. So I’m tearing apart the hallway closet looking for a headband, practically cursing under my breath because I cant find one, which is kind of weird because when I was a kid I refused to put anything on my head. Hats, hoods, those headbands. Anything. I was against them and could throw a pretty great tantrum if anyone tried to put a hat on my head. I guess this is growing up! I found a green one that my 96-year old great aunt had made and headed for the park. When I got outside I did the usual runner routine of staring at my watch waiting for the GPS to work. Linking satellites. Linking…linking…. linking….. Maybe if I walk around it will work? So I walk a bit, still staring at my wrist. Linking… linking… Come on satellites, I know you’re up there. I wander into the street like a 5 year old without adult supervision, still looking at my watch, and just miss a delivery guy on a bike. Oops. Three blocks later the watch is still linking to the satellites. Come on, Nike+… link up!!! If you don’t, how will I know how far I’ve run? Or my pace?! How will I accurately train for my triathlon? My entire training could be a lie because you can’t find a satellite. For the love of God, WHY ARE YOU SABOTAGING ME?! Oh, it linked. I apologized to my watch for being dramatic. It felt like October. Crisp air and the air had that awesome dry leaf smell. It wasn’t spring-like at all, but it was beautiful. I saw the sunset, some guy getting patted down and handcuffed by the cops, and another guy jogging in a suit. God, I love New York. 5.15 miles and I decided to call it a day. Feet, take me home! Next thing I knew I was at Starbucks. Not quite home, but I was fine with that. One Venti unsweetened green iced tea later and I was headed home for real this time!